At the foot of a great mystical rock where sages have meditated, in the heart of a colorful Rajasthan village, sits Rawla Narlai, the 17th century villa used as a hunting lodge by the Maharaja of Jodhpur. 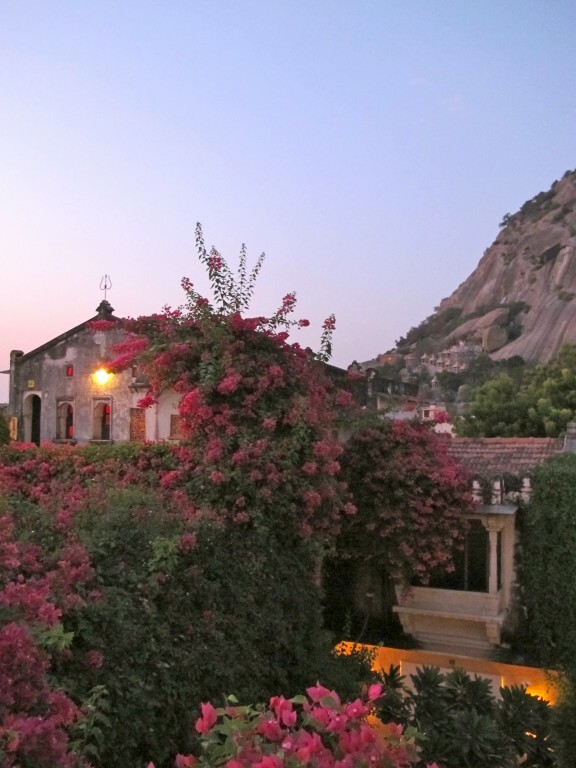 It’s now a charming boutique hotel, with cozy rooms opening onto a courtyard surrounded by cascading bougainvillea. Groups of rattan chairs sit on the white gravel and provide a peaceful place to congregate with friends, and make new ones. Through another stone arch is the inner courtyard, and the guest rooms. Before I get to the guest rooms, I have to stop and tell you how divine it was to recline, and be served tea, on these day beds under the fuchsia bougainvillea…heaven. Bedding and curtains are the lovely hand-blocked cottons of Brigitte Singh, an esteemed French designer who moved to India twenty years ago and runs a workshop in Jaipur. Rooms open onto inner cloisters, and curtained verandas, furnished with antiques and family photographs that are a reminder of the Maharaja’s presence. In the early morning, monkeys made a surprise appearance, leaping across the rooftops, and snacking on leaves and flowers. The serene swimming pool is enticing even at sunset. It’s tempting to just sit and relax on daybeds in the calm oasis of Rawla Narlai’s courtyards…but there’s a colorful village to explore, and horses to ride. What a beautiful website you have created. I stumbled upon it in my searches for minimalist beauty. Your photographs are just stunningly beautiful. Wow, so beautiful and exotic – just like we imagine India to be! As always, your pictures give us the feeling that we are experiencing the adventures with you.